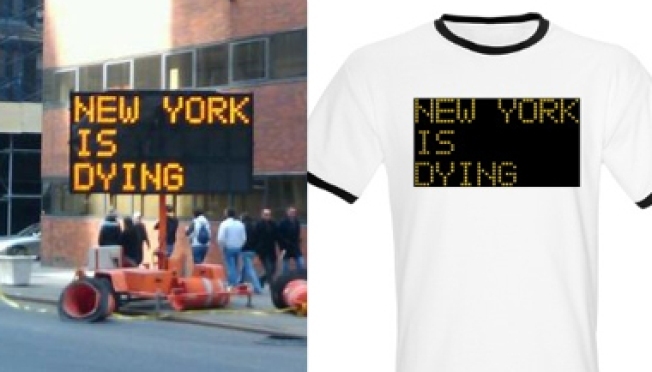 Get Your "New York is Dying" Tee! Hacked DOT signs show up as t-shirts barely a day later. Is this the life cycle of a meme? Did you happen to catch this somber message on Department of Transportation LED signs around town this weekend? Even if you didn't see them in the flesh, you likely spied the photographic evidence on Gothamist. Someone -- clearly, a person with some hacking skills, time to kill, and bitterness about the city's post-boom spiritual hangover -- reprogrammed a handful of the DOT's rerouted-traffic signs to say "New York is Dying." And now we've learned you can commemorate the experience (or just the sentiment) with a T-shirt. The sheer commercialism of it is somehow fitting (ha! ), and if nothing else, proves that New York is very alive indeed.